Gov. Bruce Rauner has suspended $26 million in social services and public health grants to narrow a $1.6 billion budget gap. Included is $7 million to pay for the funerals and burials of public aid recipients; $3 million apiece for immigrant, teen and smoking-cessation programs; and nearly $4 million for autism, HIV and AIDS awareness and other community programs. "Part of the solution to solving the inherited $1.6 billion budget hole without raising taxes or increasing borrowing is to continue to evaluate the current fiscal year's budget," Catherine Kelly, a spokesperson for the governor, said. "The Governor's Office worked with agencies to see which grants could be suspended and prioritized essential services." 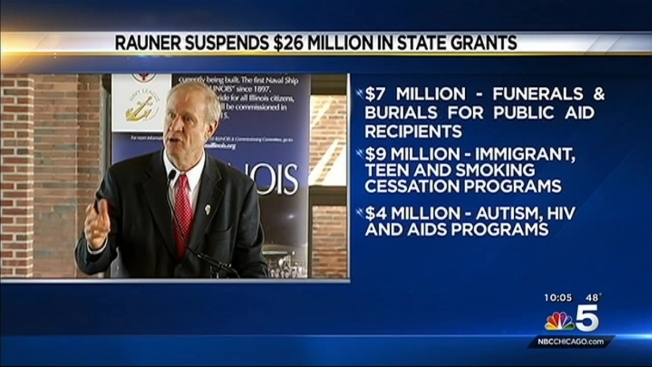 In March, Rauner suspended an uncertain amount in parks and recreation grants. The budget deal the Republican negotiated with a Democratic-led Legislature allows him to scour state-agency grants and find those lines that can best sustain cuts — at least temporarily.